You may wonder… What IS the difference is between the kickboxing offered at the local gym and the kickboxing offered at our karate & kickboxing dojo? Many people ask this question and we are always happy to explain the following…. In most cases, they are two different types of kickboxing with different goals in mind – aerobic or “cardio” kickboxing at the gym, and sport or self-defense kickboxing at the dojo. Both include kicking and punching which by nature give you a great cardio workout. At most gyms, this is where the kickboxing routines focus. The cardio classes at most gyms are just for that…. cardio. A good workout without any other elements. Where this typically differs at a martial arts studio and what makes it a “sports or self-defense version” is that it involves learning strategies and proper form with these movements, plus a lot of footwork, body movement and blocking abilities. 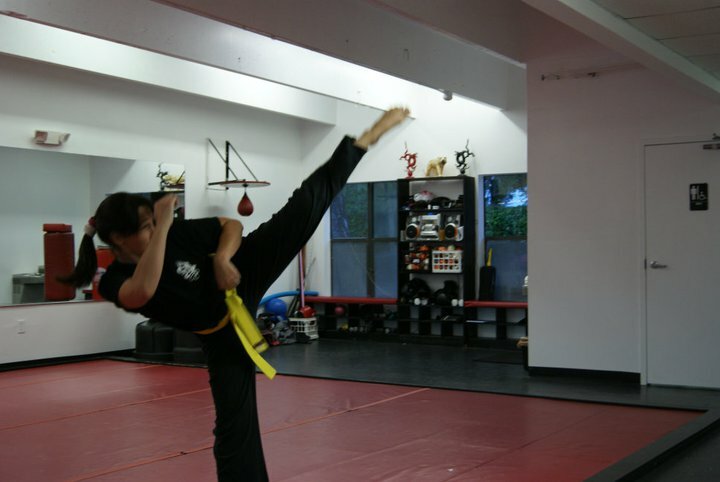 At the Boca Raton Karate & Kickboxing Academy, our Kickboxing gives you the best of both. If your focus is exercise, you will definitely achieve your goal. Plus you will learn proper form and how to move your body if you ever are faced with an opponent. The self-defense aspect of karate and kickboxing is equally important. Learn how to use these kickboxing elements properly and safely. Hopefully you will never have to use them unless you choose to compete in a tournament, but it’s good to have these tools just in case… And if you’re going to use them, proper form keeps you from getting injured. You will also increase your flexibility, strength and endurance. Either way, you should always try a class or two before committing to any style or location. Find a school that allows you to experience the class so you get a feel of the instructor, the intensity of the routine and the general mood and environment, making sure it’s right for you. Special Rate Dec 2013 and Jan 2014 only – $197 for 3 months including uniform at Boca Karate & Kickboxing! Looking for that special gift of fitness and health for yourself or someone else? Look no further! The Boca Raton Karate & Kickboxing Academy is offering 3 months of training for $197 including a free uniform. This offer is good for December 2013 and January 2014 only. Save over $160 with this special holiday deal! Act now and start training — only a few more weeks are left. And more — over 18 classes per week. 6am classes, 10am classes and evening classes are available. How much do I have to sweat to burn off ALL THAT CANDY from last night??!!! FInd out with the Boca Raton Karate & Kickboxing Academy! Halloween is a sweet time of year. Kids are excited with trick or treating, the super-hero costumes come out of the closet, the air is typically cooler, leaves are changing and of course… THERE’S CANDY!!!!!! I often get asked… so how long do I have to work out to burn off the basket of bite-sized candy bars I ate last night??? The answer depends on how many calories are in that basket of candy or the individual candy bar. For example, usually a standard full-size Snickers bars has 250 calories and 12 grams of fat (4.5 being saturated fat). Of course there are numerous exercises that can be done to minimize the calorie intake. Spin for 30 minutes; go on the step machine for 40 minutes or run for 2.5 miles. However, the saturated fat in the candy bar stays on/in your body and will remain there for a couple of days so…. Keep on burning those calories my friends! The Holidays are coming fast…. are you IN SHAPE & READY? Time for Boca Raton Karate & Kickboxing Academy! It’s OCTOBER everyone!!!! The kids are settled into school routines and we have this small window before the holiday season is upon us full force. Now is the time to commit to getting in shape for kids and parents alike. Imagine preparing for the upcoming Holiday Season in the best shape of your life in all areas – Mentally, Physically and Emotionally. Sounds GREAT! So… how can you accomplish that? First, you must make a decision accompanied by a first step that takes action toward that goal. And we make that first step VERY EASY for you! Come try Boca Raton Karate & Kickboxing Academy in west Boca Raton. Take several classes over 30 FREE DAYS. Try a class in kickboxing with power and flexibility drills. Take a cardio class and sweat to some great music for an hour (we offer over 15 fitness classes per week!). Find out why Kenpo Karate is so popular and considered to be the top in real world self defense training. Regardless of your specific goals, all our classes help you improve your flexibility, strength and endurance. Come and enjoy your time at BRKKA…. we are here to help you ACHIEVE YOUR GOALS! Have fun, relieve stress and learn to handle daily challenges in a proactive and positive manner while keeping yourself and your family safe and fit. We all have many roles and responsibilities that set our priorities. We are employees or employers, we are parents, we are students, we are friends and relatives… and our roles guide us day to day in what we need to do to be considered successful. Many of us, especially adults, can lose the priority of taking good care of yourself first and foremost. And it makes perfect sense… right? If you are at your best, you can give more to others and better meet the needs of all the other roles in life…. So where does it break down? Where do we get lost in putting everything and everybody else first? Why do we value other roles more than the job of being the best you possible? Good health fuels everything we do. It gives us quality of life, longevity, capabilities to get out and experience the world. It helps create inner peace, good moods and overall satisfaction. If nothing else, it sets a great example for those who look at us for guidance. So it’s time to re-prioritize and get healthy! Start with a healthy you — the rest will follow. Nutrition, exercise, rest, activities that grow the mind, body and spirit and of course, fun and laughter. The answer lies within you. Start today, start anywhere. Just start. Kickboxing might be the beginning or it may be something else…. but just start and do it now! You’re worth it! Kickboxing is a combination of kicking and punching from the arts/sports of karate, Muay Thai and boxing. Kickboxing classes vary from the serious martial art of Muay Thai to more exercise-oriented cardio class. At the Boca Raton Karate & Kickboxing Academy we bring these two elements together. We teach kickboxing using proper form, so what you learn will minimize risk of injury. Kickboxing is part of our Kenpo Karate practice, teaching self-defense and benefiting from great cardio. Anyone at any age can train in kickboxing. It’s all about getting out there and moving – setting your own goals and making improvements as you train in strength, flexibility and cardio endurance. Kickboxing gives you a total body workout that will help get you into shape inside and out. – Remove the stress of your day by kicking and punching. – Work your core – kickboxing challenges balance, coordination and flexibility alike. – Sweat and rid your body of toxins while releasing endorphins. Increase overall energy. Kickboxing at the Dojo or the Gym… What’s the Difference? Try 30 FREE DAYS at the Boca Raton Karate & Kickboxing Academy! In most cases, they are two different types of kickboxing with different goals in mind – aerobic or “cardio” kickboxing at the gym and sport or self-defense kickboxing at the dojo. Both include kicking and punching which by nature give you a great cardio workout. At most gyms, this is where the kickboxing routines focus. The cardio classes at most gyms are just for that…. cardio. A good workout without any other elements. Where this typically differs at a martial arts studio and what makes it a “sports or self-defense version” is that it involves learning strategies and proper form with these movements, plus a lot of footwork, body movement and blocking abilities. Martial Arts Lessons for Adult Men and Women –a Good Idea?